In magical books such as Landline and Eleanor & Park, Rainbow Rowell has proven herself to be a writer of exquisite lyricism and heartbreaking characterization. In Fangirl she managed to not only create beautiful characters but, in Simon Snow, the object of the main character’s fangirl obsession, Rowell even managed to create fictional characters that were equally fascinating. In Carry On, Rowell (re)introduces the characters of Simon Snow and the world that started Cath’s obsession in Fangirl. 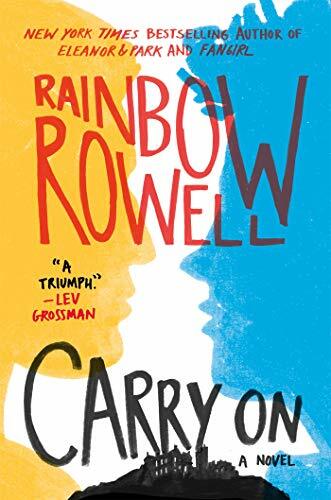 While not quite as lyrical or heartwrenching as Rowell’s previous works, Carry On is nevertheless drenched in the immediacy and intimacy that are her hallmark. With that said, however, it is impossible not to mention the elephant in the room. And not just an elephant. A giant literary herd of them let loose and haunting every single page like the ghosts which are an integral plot point to Carry On. Those “visitings” start the whole ball of wax rolling. Taking place at Watford, a magical boarding school for young mages, Carry On finally takes Rowell into the world of magic that she always managed to create in her non-magical tales. And then, there is the elephant. In Fangirl, it was possible to ignore the elephant when talking of the Wizarding World of Simon Snow because it was a fictional construct/conceit within the fictional world of the novel Fangirl. Given new life in his own novel, Simon Snow and Carry On are on their own, and therefore it’s virtually impossible to ignore that elephant for long. Even in this review, that elephant is obvious to anyone who’s been reading popular literature over the last 20 years. It’s impossible to ignore the cultural and literary impact that J. K. Rowling has had with Harry Potter. In Carry On, Harry is named Simon Snow. Draco is named Baz. Hermione, Penelope. Dumbledore, The Mage, etc. For all the glory of Rainbow Rowell’s writing, for all the beauty and the talent, Harry Potter weighs constantly on Carry On, begging the reader to ignore the elephant and try to just enjoy the book. Perhaps if the writing matched Landline. Or Eleanor & Park or Fangirl, that might have been possible. But Carry On, while a wonderful book wonderfully written, an interesting story interestingly told, is not Landline. It’s not Eleanor & Park or Fangirl. Those books were, simply, impossible to put down, stay up until four in the morning to finish, crying most of the way types of books. Carry On never quite reaches those heights. And it’s not because of the elephant. Fanfiction is a glorious tradition and having an author as talented as Rowell pay homage to Harry Potter is a viable concept. But in a novel that references pop culture, taking place in contemporary London, it is just not possible to ignore that elephant while reading. And if you can’t forget about the elephant you’re left with no choice but to make, probably, unfair comparisons. Where the Wizarding World of Harry Potter is a magical, once in a generation literary landmark, the Wizarding World of Simon Snow is a well-written, entertaining read that mostly serves to remind the reader what we loved about Harry, Ron, and Hermione. Where Rowling created magic, Rowell creates illusion, leaving the reader wanting to reread the Potter series as well, of course, as her own brilliant literary landmarks: Landline, Eleanor & Park, and Fangirl precisely because those earlier Rowell books are where she creates real magic, not the artificial construct of Carry On, which simply can’t escape the shadows of all those elephants. Peter Adam Salomon is an author of young adult horror and thrillers. His most recent novel is All Those Broken Angels (Flux). Other literary activities include editing the first book of poetry released by the Horror Writers Association, Horror Poetry Showcase Volume 1.